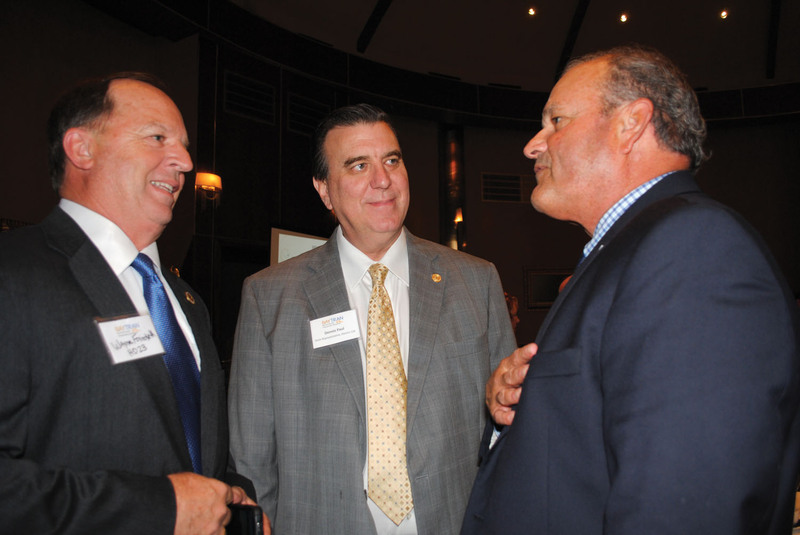 TxDOT Executive Director Lt. Gen. Joe Weber, center, talks with Kemah City Administrator Rick Beverlin, left, and Seabrook Mayor Glenn Royal after addressing the Bay Area Houston Transportation Partnership luncheon at Cullen’s Upscale Grille. 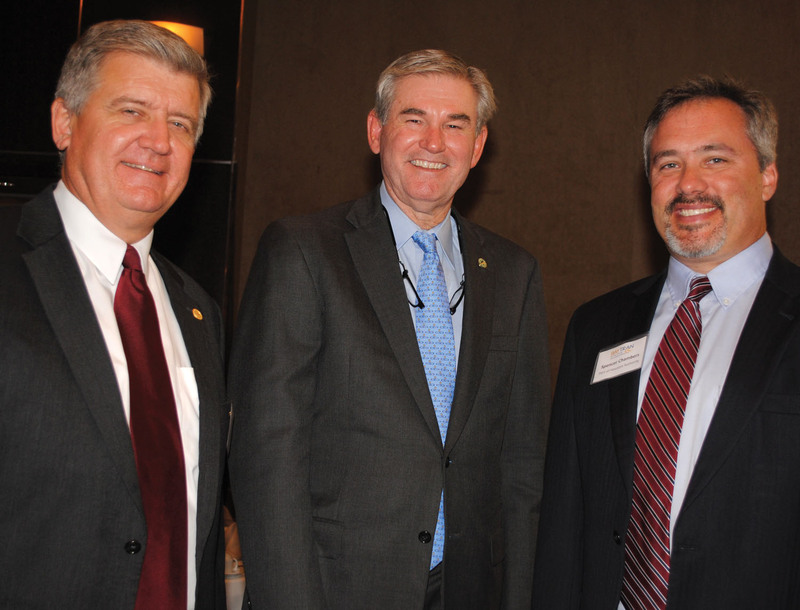 Bay Area Houston Transportation Partnership was in for a rare treat this past month when the head of the Texas Department of Transportation, Executive Director Lt. Gen. Joe Weber was the keynote speaker for its monthly luncheon. He drew quite a crowd of state, county and city officials, anxious to hear his opinion. 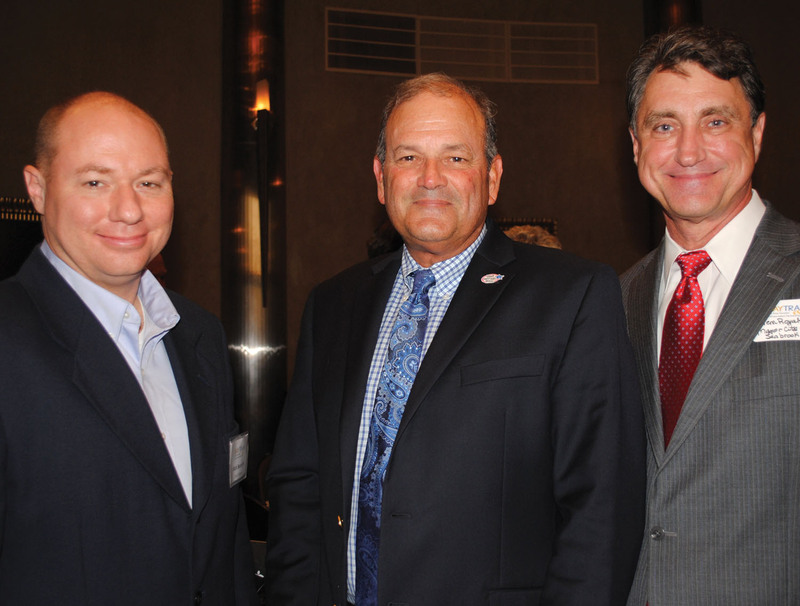 State Rep. Ed Thompson, center, stops for a visit with Port of Houston Executive Director Roger Guenther, left, and the Port’s Director of Governmental Relations Spencer Chambers, a BayTran Board member, at the BayTran monthly luncheon at Cullen’s. Among them were State Reps. Wayne Faircloth, Dennis Paul and Ed Thompson, all just back from the legislative session in Austin; Galveston County Commissioners Ken Clark and Joe Giusti, former Commissioner Kevin O’Brien; Mayors Tim Paulissen of League City, Glenn Royal of Seabrook and Louis Rigby of La Porte; Pearland City Manager Clay Pearson, Kemah City Administrator Rick Beverlin, Webster Economic Development official Karen Coglianese, Galveston County Engineer Mike Fitzgerald and Seabrook City Councilman Robert Llorente. He told of taking over his job in April 2014 and trying to patch Texas roads with insufficient funds as container traffic continued to grow, putting more trucks on the state’s roads, and even more expected with the opening of the rebuilt Panama Canal. “We can’t build our way out of this,” he thought to himself, he said. “We have to think our way out.” So far, if the November ballot item passes, TxDOT has about $4 billion coming its way, which will not meet all the state’s need but should be a help. 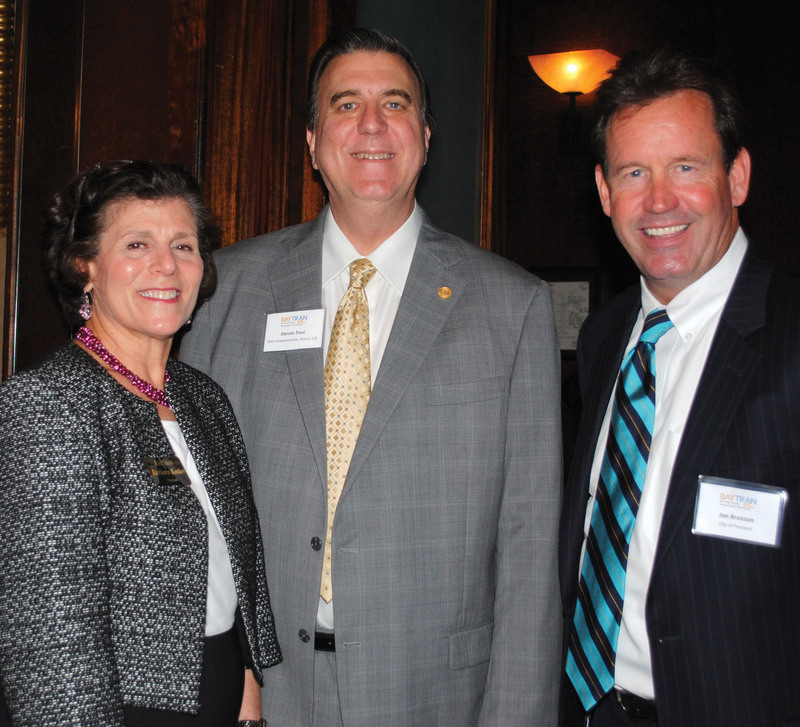 BayTran President Barbara Koslov and Chairman Jon Branson, right, welcome State Rep. Dennis Paul to the June 18 monthly luncheon at Cullen’s Upscale Grille. 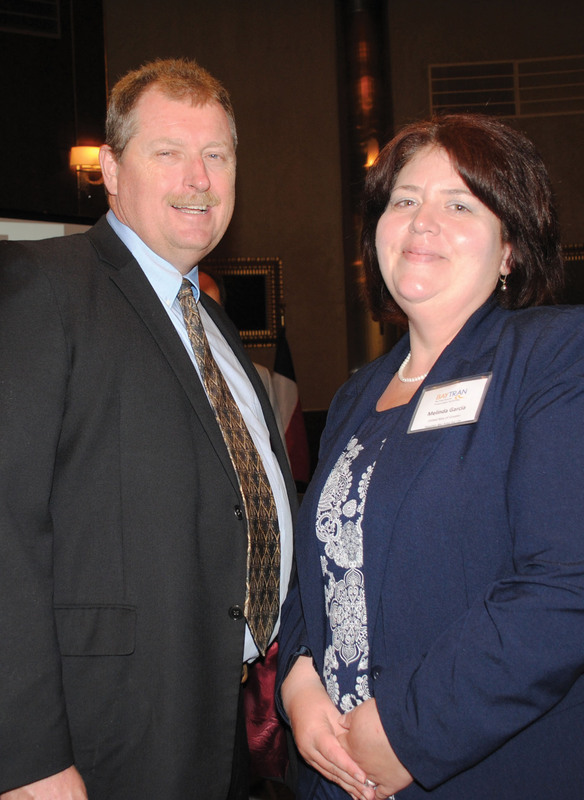 Kim Morrell, right, chats with Dale Conger at June 18 BayTran luncheon. Galveston County Commissioner Ken Clark and United Way Executive Director Melinda Garcia. 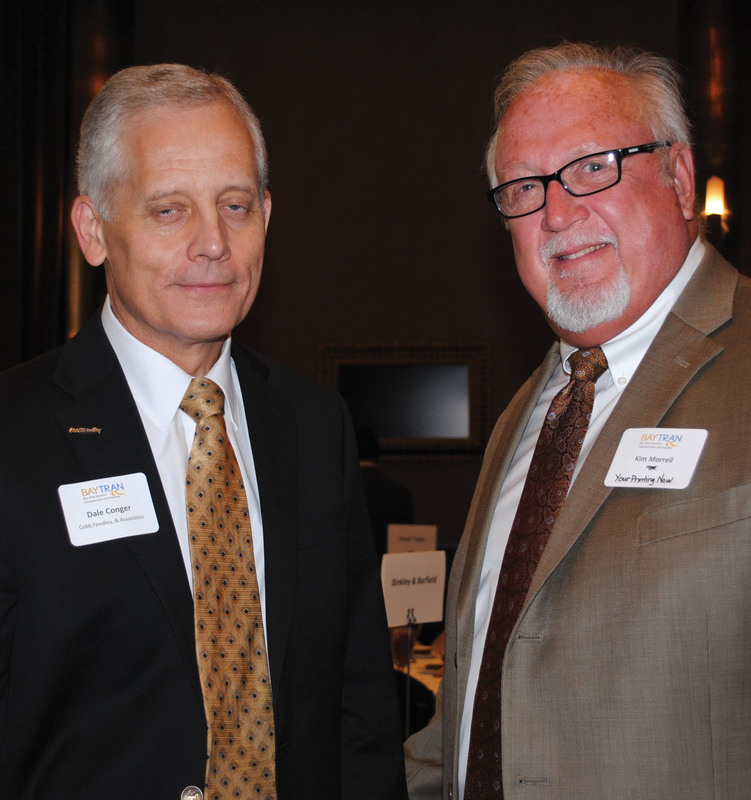 State Rep. Wayne Faircloth and Dennis Paul, from left, talk about the recent legislative session with TxDOT Executive Director Lt. Gen. Joe Weber during the Bay Area Houston Transportation Partnership’s monthly luncheon June 18 at Cullen’s.